Kalido, the leading independent provider of data governance solutions, and Teradata (NYSE: TDC), the world's largest company solely focused on data warehousing and enterprise analytics, today announced the availability of the Kalido® Information Engine™ on the Teradata® platform. The Kalido Information Engine on Teradata combines the implementation speed enabled by Kalido's business-model-driven information engine with Teradata's market-leading, high-performance data warehouse solutions to deliver fast data warehouses faster than ever before. The Kalido Information Engine leverages Kalido's business-model-driven approach to capture user requirements faster with ultimate agility. Kalido's highly automated solution reduces the need for custom code, lowering both implementation and operating costs. Teradata's active data warehousing technology enables organizations to maximize capacity by delivering an extremely fast, high-performance data warehouse, making it easy to keep pace with increasingly complex data warehouse workloads. The release of the Kalido Information Engine on Teradata has been specially designed to take advantage of Teradata's high-performance capabilities. In initial Kalido tests, transactions were loaded more than three times faster on Teradata than on a comparable Oracle database and more than 14 times faster than on a comparable SQL Server database. 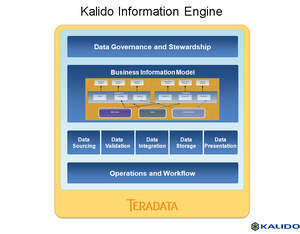 The Kalido Information Engine on Teradata is immediately available for customer evaluation and will be generally available in November. "The increasingly complex and changing data types coupled with explosive data growth demands that data warehouse architectures must adapt ever more quickly. Metadata driven tools for integration, models and even sourcing of the architecture are significant contributors to the highest levels of warehouse agility. Tools which can manage and deliver versions in all areas of the architecture raise the warehouse from being just a big IT project toward becoming a nimble, competitive differentiator." "Teradata customers thrive on speed -- and they get it every day with the Teradata platform. With Kalido on Teradata that speed becomes dynamic power for implementation and change." "Our initial discussions with customers and prospects have shown us that the demand for Kalido on Teradata is very high. Our customers want to build their data warehouses right, but they also want to build them fast. This solution helps them do both without requiring an army of consultants and extra resources that they might not have." Visit the Kalido blog, "Kalido Conversations"
Teradata Corporation (NYSE: TDC) is the world's largest company solely focused on raising intelligence and achieving enterprise agility through its database software, enterprise data warehousing, data warehouse appliances, consulting, and enterprise analytics. Visit Teradata on the web at www.teradata.com. Kalido is the leading provider of business-driven data governance software. Kalido enables companies to manage data as a shared enterprise asset by supporting the business process of data management. Kalido software has been deployed at more than 300 locations in over 100 countries, including 20 percent of the world's most profitable companies as determined by Fortune Magazine. More information about Kalido can be found at: http://www.kalido.com.